AFTER surviving bloodshed at the hands of their Indonesian occupiers, the newly liberated East Timorese are facing a new threat. A Claretian priest from the fledgling nation said moves by the East Timorese Government to weaken the role of the Catholic Church was one of the major challenges facing the people. Fr Cyrus Banque, who is parish priest of Bobonaro, near East Timor’s western border, was in Brisbane in late September as a guest of the Emmanuel Covenant Community and parishes forging links with communities in the developing nation. “The biggest challenge would be that the Government is trying to weaken the influence or the role of the Church, so they’re not very co-operative with our programs (to develop sustainable communities),” he said. Accompanying Fr Banque was Joao (John) Vincente, who, along with Alfonso Lopes, were also concerned that the Government was sending students to Cuba and China for training. “It makes me feel afraid because, after seven years in Cuba, they might return as very strong Communists,” Mr Vincente, who is parish council president in Maliana. 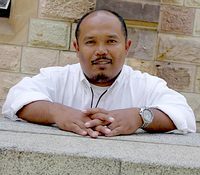 Fr Banque, 39, is director of Dili diocese’s Catholic Justice and Peace Commission and has worked with the peace and reconciliation program established by the United States-based Catholic Relief Services after East Timor’s first democratic elections in 2001. More recently, the diocese appointed him to be part of an organising committee for protests over Government moves to restrict religious education in schools. He was in charge of logistics and security and in organising the involvement of parishes. “It was dangerous for me because I’m a foreigner (from the Philippines), and a demonstration is a political activity,” he said. Mr Vincente said that was probably because there is strong support among East Timorese people for priests. The East Timorese are overwhelmingly Catholic. The protests were about a Government proposal for religious education to be taught only outside regular school hours. “That meant two o’clock in the afternoon – we have classes from eight o’clock in the morning until two o’clock in the afternoon. “Two o’clock is the time for them to go home for their lunch. It is a ridiculous proposition – how can you teach people who are hungry? “It’s saying religion doesn’t matter. “After the demonstration we got religion back to regular classes. Now it’s two hours per week. Fr Banque was pleased with the success of the protest campaign. “We had 20,000 to 30,000 people who came for 20 days of demonstration. “We achieved something – we showed the world that the people of East Timor can demonstrate peacefully. Mr Vincente, 41, said the East Timorese were optimistic. He said because they had endured so much suffering in the lead up to independence, “everyone wants to be peaceful”. Mr Vincente said much depended on the leadership of the country, and there was widespread frustration because of the high level of unemployment. “Most people are jobless and live on less than (US)$1 a day,” he said. Fr Banque said the people were hopeful of forging a better life with independence “so we must trust in God”. He said he became involved in the work of the Justice and Peace Commission “mainly because we were having a lot of village trouble regarding land disputes in our parish and, secondly, we had many people asking the Church to mediate”. “Only the Church can mediate because the people lack trust in the local authorities,” he said. Fr Banque said he became involved also because of conflict among young people, social and tribal. “We have young people who are used by the politicians to do their hidden agenda, like destabilising the situation. In response to these problems, the Church runs programs aimed at fostering attitudes of peace and harmony among the young people and an awareness of the dynamics of violence. Fr Banque said young people were trained how to become mediators and they were taught the value of reconciliation. “The political leaders always teach the people to be divided, to encourage differences, to highlight differences, so the Church has to highlight the same vocation of the Timorese people – to work for peace, to build up their own country. “Through these programs we make people aware they have a vocation to work for peace and they realised how much they became victims of political forces and tribal history. Fr Banque said the Church was slowly gaining the confidence of the young people. The Church in East Timor lacked the resources to create employment, but Fr Banque said it was trying to promote skills training by sending some students to agricultural schools and helping others to attend technical schools to be trained in such areas as mechanical, electrical and carpentry trades. Scholarships are also offered for talented students. Fr Banque said this was one way partnerships with parishes, schools and communities in Australia could help. Bobonaro and Maliana parishes are also involved in helping young people grow in their faith and spirituality. Fr Banque said youth were being trained in public speaking so they could proclaim the Gospel to their peers. He appealed to the Australian Church to “be in solidarity” with the Church in East Timor so it could maintain its development and faith programs and help the people work towards sustainability. Fr Banque said this was happening in Maliana where the Emmanuel Covenant Community and several Brisbane parishes were working with the people to provide tractors and agricultural tools on farms. Support was also being given for faith and justice formation programs.